I love pasta, but I don’t love the carb heaviness it can leave me with afterwards. In fact, just this week I ate one small pancake at Bob’s Red Mill and on the way home I felt tired enough for a nap after only being up for about 3 hours. So my simple solution to off-setting the carbs is to sub in vegetables for two-thirds of the noodles. This not only makes the dish lighter in general, but also provides another two to three servings of vegetables which pretty much benefits everyone whether they like it or not (i.e. husbands). I’ve used carrots for 100 percent of the noodles in a pasta dish before but it ultimately left me feeling unsatisfied. 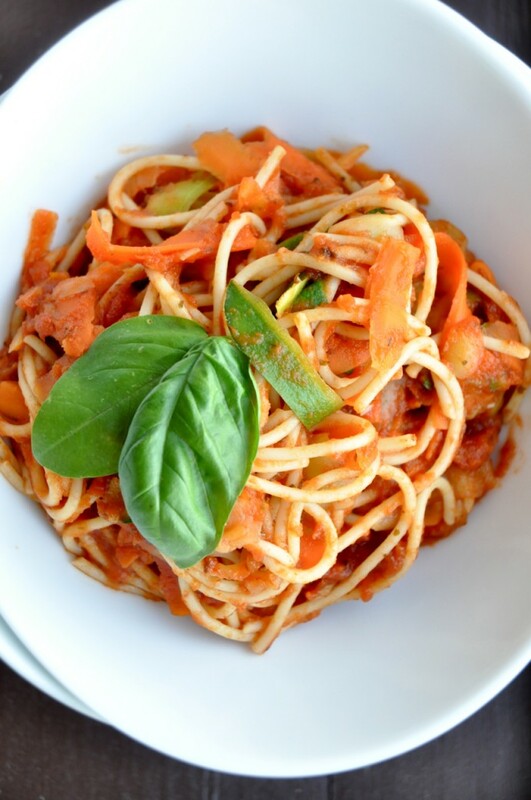 So by mixing carrots and zucchini ribbons in with whole wheat spaghetti noodles, I was able to satisfy my raging pasta cravings with less than half the calories. Not to mention, it’s quite a beautiful dish. 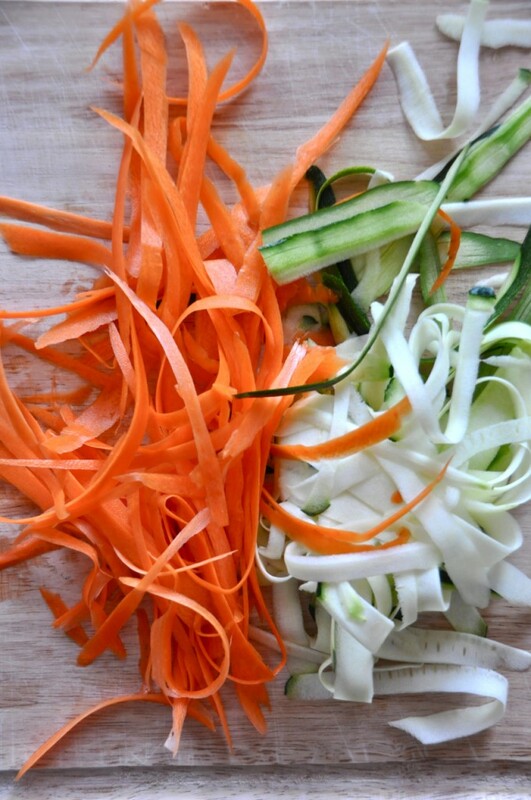 Ribboning vegetables is simple: Just rinse the veggies and peel away any rough parts of the skin with a vegetable peeler, and then continue to ribbon out the vegetable until it’s practically gone. 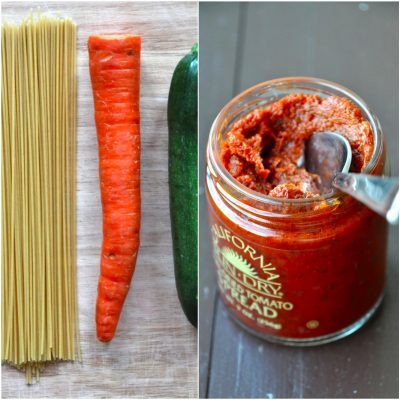 And if you’re looking for an easy way to spice up your go-to marinara, simply add in some sun dried tomato sauce or spread to give it a sophisticated twist without much effort. This simple, 5-ingredient pasta comes together in about 15 minutes and is full of flavor from the sun dried tomato sauce. Add a few sprigs of basil on top to give the dish a fresh note. It can be made vegan by forgoing cheese, and gluten-free by using gluten-free pasta noodles. Cook the noodles according to package instructions, shooting for al dente. Rinse and peel any rough skin spots from the carrot and zucchini. Then continue using the peeler to ‘ribbon’ them into noodles. 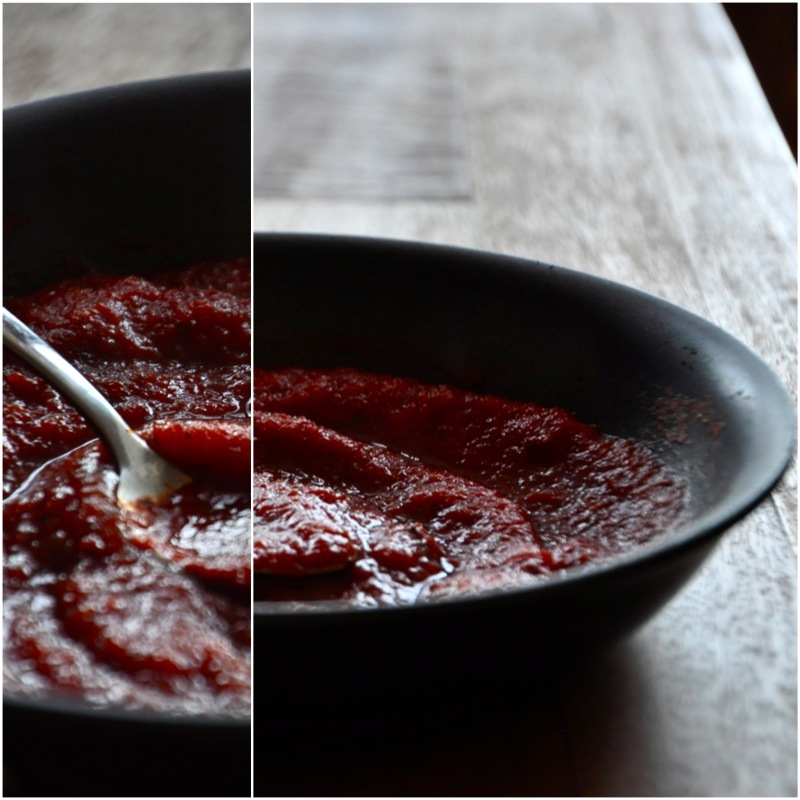 Combine and warm your tomato sauce and sun dried tomato spread in a medium saucepan over low-medium heat, stirring to combine and adding a little water if too thick. Once noodles are done, scoop them into a strainer (reserving the water) and cover with towel to keep them moist. Add pasta noodles and vegetable noodles into the sauce, toss lightly and serve immediately. Garnish with vegan parmesan cheese and basil for additional flavor. *Use gluten-free noodles to make this dish gluten-free. I loved this dish not only for the flavor and ease of preparation, but also for how healthy it was. I was so satisfied by the time I’d finished my bowl, which probably contained at least 2 if not 3 servings of vegetables. If you’re not a fan of marinara, you could also toss your noodles in pesto or a mix of olive oil, garlic and parmesan instead. 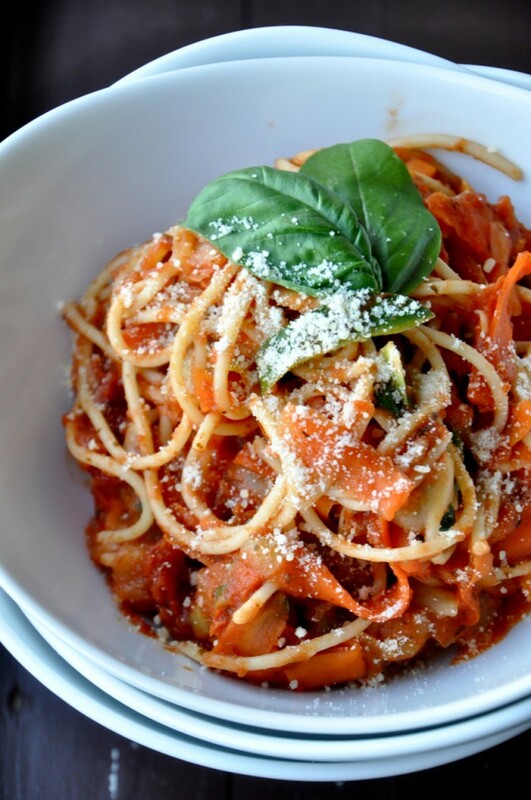 What is the best red pasta sauce without dairy? Excellent recipe. I love it. All your advices were very useful. Thank you very much for your help. My family and I always will remember it. Had this for lunch and loved it! Amazing how something so simple can be so good. The sauce is so full-bodied (dare I say it—almost meaty!). My only changes were to saute the zucchini and carrot ribbons in a little olive oil with some garlic and add some dried basil and oregano. Yum! Why can’t Italian (or any) restaurants offer something like this to their vegan customers? Oh well, that’s where cooking at home comes in as such a winner, nutritionally and gastronomically. I had to smile at your photos and my actual lunch because it was so pleasing to the eye, with the colors and textures. I had just looked at some photos online of a Meetup group that ate at a typical Southern restaurant here in Atlanta. Everything was beige and fried! I am not exaggerating. The only colors were a little cranberry sauce for the turkey and the canned peaches, although they were covered with cottage cheese. Okay, I am being judgmental. And I am also being grateful for people like you who show us the way to great eating without sacrificing our tastebuds or our health! Dana, should roasted red pepper be in this? You mention it under the description before you give the recipe, but all I see is tomato sauce and sun dried tomatoes. Nope! Sorry that was a typo. Just sundried tomatoes. I’ll fix that! This is an amazing recipe. This was a great hit at home, and I’m definitely going to make this more often. I added broccoli as well, and it tasted great. You guys are fantastic. This is the fifth recipe I’ve tried from this website, and not one recipe has failed. Thanks!! This sounds great! 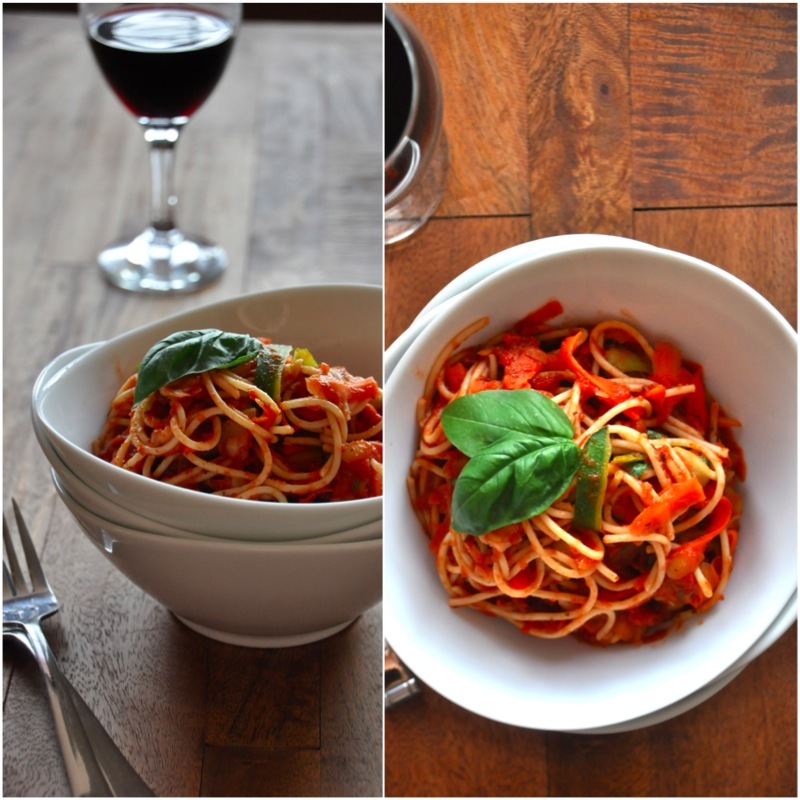 Do you have a recipe for the red pepper sauce you mentioned, as well? 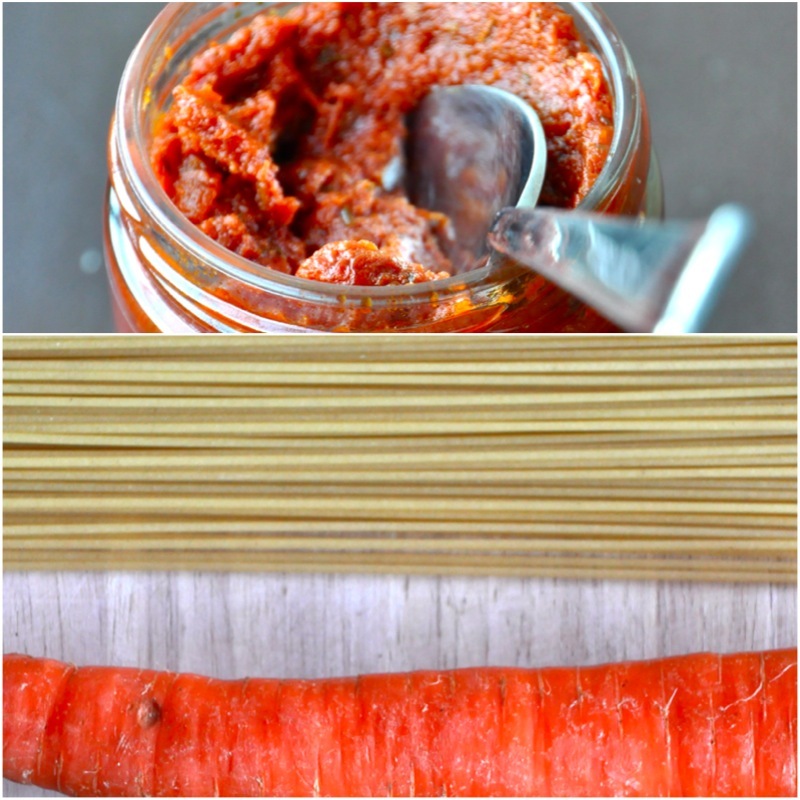 I just had a romesco sauce for the first time and I’m hooked! This looks delicious! 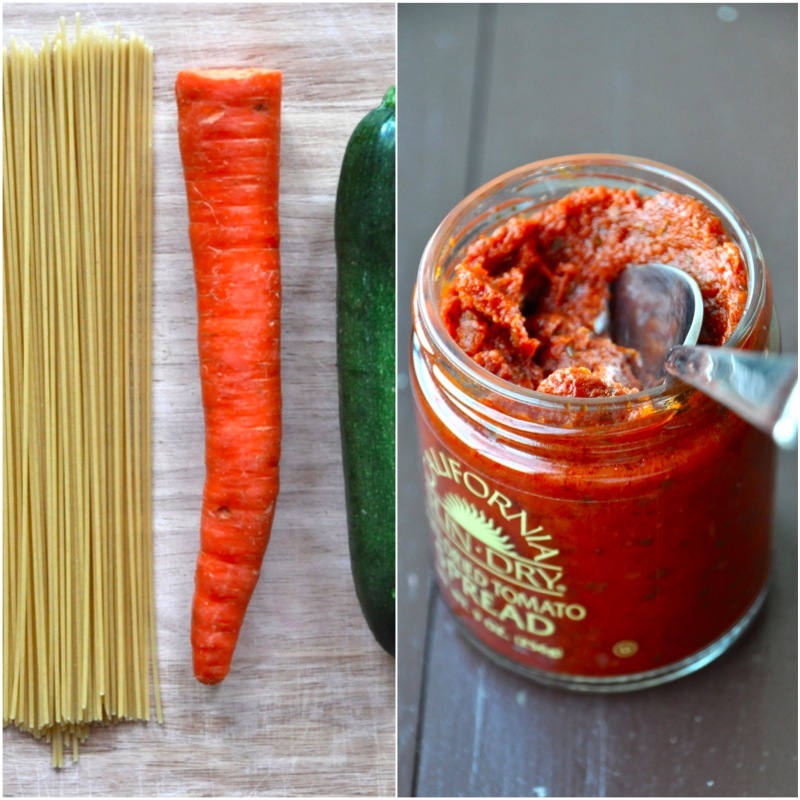 I love carrots and pasta but I haven’t found many recipes that combine the two. I need to make this soon. Hi, Dana! Stopping by your blog from Pinterest. I love what you see and I’m so glad you decided to start up a blog and share. We will be trying the oatmeal choc chip pancakes on Sunday (hopefully) and this lovely pasta dish in the very near future. I am thinking of even trying it with some white spaghetti recipes I’ve seen. I’m adding you to my Google reader. Just thought I’d drop a note and say hi. what a beautiful, delicious solution to a traditionally carb heavy dinner. i love the ribboned carrots and zucchini. beautiful photos! Girl, ONE small pancake fills you up!? I’m concerned! Ha ha, I had one “small” restaurant sized pancake – which was huge – and an egg with tons of fruit. One pancake would never fill me up! 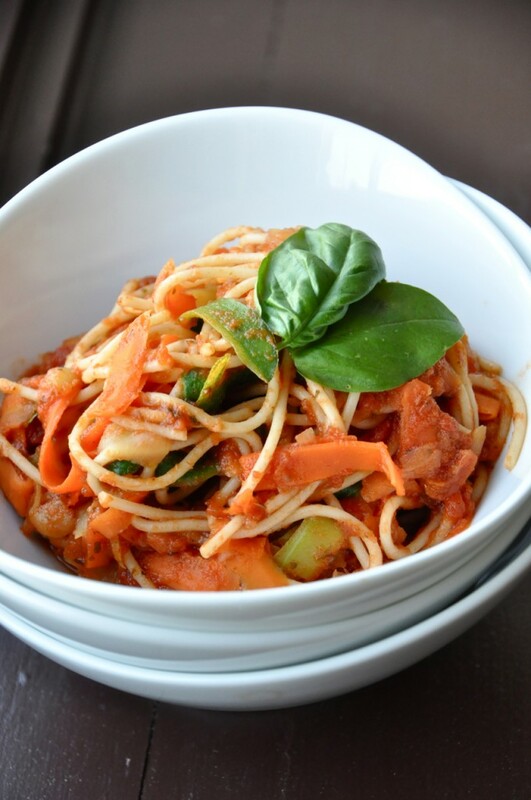 i adore the idea of combining spaghetti noodles and veggies. i need a few carbs in my life, afterall!